New discovery. Contrary to the austere and stern W3C spec, if you have a id tag with value “ααα”, it passes W3C validator as valid!. See: W3C HTML Validator Invalid. CSS junk is when a site has tons of CSS piled up and half of it is not used. if you are running Google Plus pages, often you see a interesting post and you want to comment/share, but you want to do that with your personal account, not your page account. How to do that? Paste in a new tab. That's it. Google Health (2008 to 2011). This is envisioned to be a centralized health records system, but nobody wants to use it. Google PowerMeter (2009 to 2011). This is a software that lets you view your energy use. First, you need to install a Smart meter. Then, this is hooked up to Google somehow, so you could view your meter usage on a Google site, with nice charts. A normal meter just records your usage, and periodically someone comes to check it and bill you. Smart meter differ from normal meter in that it can record hourly usage and communicate that automatically, to the utility company or to you. So, the data can be analyzed and visualized, almost in real-time. Google Blog, grey on white screenshot. For more, see: Web Design: Grey Text on White Background. When's Google Gonna be as Hateful as Facebook? Google is really getting on people's nerves in past 2 years. She wants to hear from you: start sharing with her and comment on her posts. Instead of a factual notice, Google gratuitously added “She wants to hear from you”. I suppose this is part of Search Plus Your World going forcefully down our throats. When is Google Plus gonna become like f￼cking Facebook? Discovered Dillo, a basic browser. let's look at Dillo. So, what is it? Quote from Wikipedia. Dillo is a minimalistic web browser particularly intended for older or slower computers and embedded systems. It supports only plain HTML/XHTML (with basic CSS rendering) and images over HTTP; scripting is ignored entirely. Dillo is available for Linux, BSD, Solaris, DOS / FreeDOS and Mac OS X. Due to its small size, it is the browser of choice in several space-conscious Linux distributions. Released under the GNU General Public License, Dillo is free software. that's like a lol. Who will actually find it useful? this is year 2012. Sure, there are still people on modem and using computers that's 10 years old. But first of all, how many such people exist? probably less than 1/100000 of the internet users. Your account security requires verification. That Google URL above actually points to this: 〔http://www.mobila.be/wp-content/themes/concise/scripts/cache/GG.htm〕. 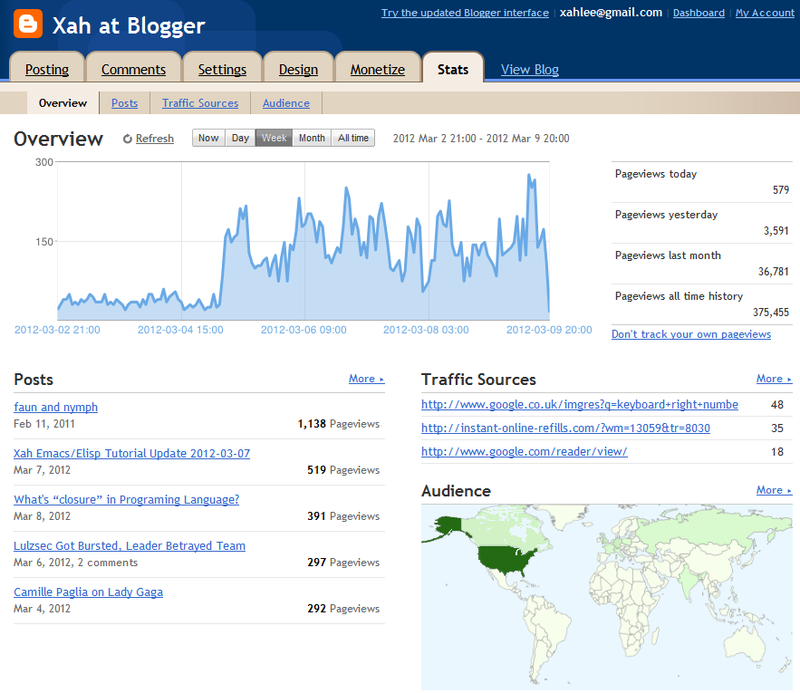 Blogger Traffic Surge Due to UI Change? I stopped blogging in Jan 28th, and started in Feb 29th, and changed my blogger interface from a static template to blogger's new dynamic template on March 5th. For reasons unknown to me, my blogger traffic is about 8 times more starting on March 5th. Is it due to the dynamic UI?